I get the impression that Conor is smoking a lot of weed these days. Not that I’m judging! Yum! Except what’s that brown stuff up top, between the pancakes and the beans? Where are you, Conor? I was thinking that the plate at 10 o’clock was some kind of fried cornbread, and the vegetable on the main plate was collard greens. If not for the meat on the main plate, I’d think the South. But who would possibly travel south and order roast beef instead of pulled pork? 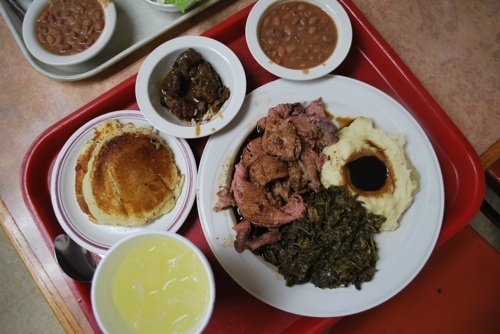 The photograph is taken in Nashville, TN, at a place called Arnold’s Country Kitchen if memory serves — it’s a little “meat and three” lunch room. Why roast beef instead of pulled pork? That’s the meat they had that day. Actually I probably would’ve gotten the chicken liver and dirty rice instead, but we got there late, and they were out of it. That image haunts my dreams. I wish I could un-see it. Meat and three! Of course! You wouldn’t want to order barbecue in Nashville, anyway. But now I’m hungry for chicken livers. No one’s answered my question. I recognize everything except the dark brown stuff to the left of the beans. What is it? … so they were just out of rice?